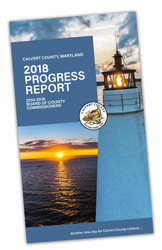 The Calvert County Board of County Commissioners is proud to present its 2018 Progress Report on local government initiatives and accomplishments from the board’s four-year term covering 2014 to 2018. The report provides an overview of county government operations in a variety of areas. Calvert County’s financial management approach helped earn top bond ratings from three independent credit ratings agencies. It was the first time in Calvert County’s history that it received AAA ratings from all three agencies. Calvert County Government underwent a reorganization to provide citizens the best customer service in the most efficient and cost-effective manner possible. Calvert County Government implemented a service-based budget approach to estimate the costs of every service and function the county provides to create a structurally sound spending plan. The BOCC renegotiated the third, four-year public schools funding formula to determine the amount of annual county appropriations to fund Calvert County Public Schools from FY 2018 through FY 2021. Public safety spending increased, including a contract award to Motorola Solutions Inc. to provide the Calvert County Sheriff’s Office and county fire/rescue/EMS volunteers with a new state of the art 800 megahertz digital communications system. Linda L. Kelley Animal Shelter construction is underway in Prince Frederick and will provide 12,910-square-feet of space. Construction continues on a new, multi-story, modern Northern High School building to accommodate more than 1,400 students.